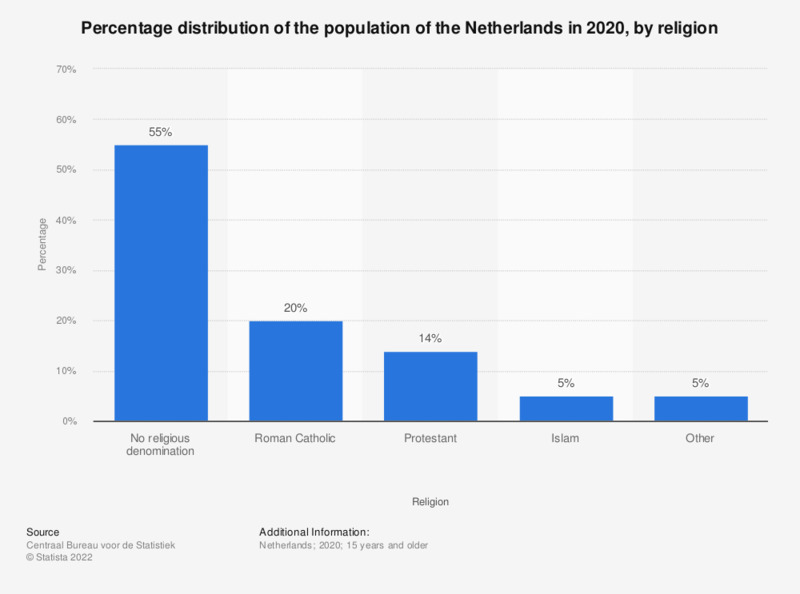 This statistic shows the population of the Netherlands by religion in 2017. This statistic shows that in 2017 half of the Dutch population did not identify with any religious denomination. Of the religious population, the largest number of people (nearly 25 percent) identified themselves as Roman Catholics. That is particularly interesting, as the dominating church in the Netherlands since the Reformation had been the Protestant church. According to the source, approximately 15 percent of the Dutch population considered themselves a member of the three main protestant churches, the Dutch Reformed Church, the Protestant Church in the Netherlands and the Reformed Churches in the Netherlands. The category 'other' includes not only the smaller protestant churches, but also religions that are newer to the Netherlands, such as Buddhism, Hinduism and Islam. According to this statistic, Muslims made up five percent of the population in the Netherlands.